A huge area with something for everyone. 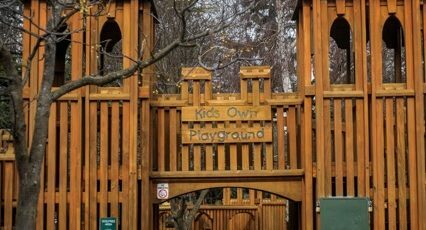 The playground is big with a wide variety of interesting equipment to suit a range of ages. But this park offers a lot more than just a playground; other free activities include seeing the deer which like to be fed acorns (if you’re visiting in Autumn, pick them up off the ground near the deer fence); a scooter/skateboard park and a BMX track. There’s also lots of space to run around, have a picnic under a big old tree etc. 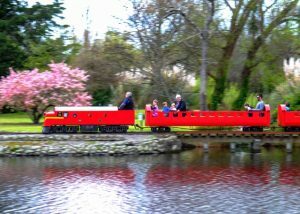 Other activities on offer for a fee are: a train operating on weekends and public holidays; mini putt and boating lake (summer only). Clean toilets are located near the mini putt. If the weather turns while you’re there, think about going to the swimming pool at the Trust House Recreation Centre which is just across the road. TOP TIP: look out for eels in the water as you pass over the mini bridges near the lake and playground. Address: Dixon Street, Masterton (going all the way to Park Ave). Parking is available on Dixon Street and Memorial Drive (Memorial Drive is closer to the scooter/Skateboard park and deer).